Besides living a long and eventful life, Thomas Lovewell provides a convenient focal point for observing the tide of events that swirled around him as he left his footprints across the West. It can also be enlightening to trace the lives of people who crossed paths with him. As I’ve written before, one of the men in "Pikes Peak or Bust" appears to be John Honeywell Williams, a native of Devonshire who brought his family to America in the mid-1850’s. After years spent working in the mines of northern Michigan, John took his son Richard with him on a brief return visit to Colorado seven years after the Pikes Peak photograph was taken. The boy must have been impressed by what he saw. A few years before his father crossed the continent to settle in San Jose, Richard Broad Williams moved to Colorado, where he would spend the rest of his days. He became a successful businessman, politician, and popular lawman in Central City, serving four terms as Sheriff of Gilpin County and two as mayor. At the age of forty-eight, Richard Williams was mortally wounded at the end of his second term as mayor in 1896, when he tried to come to the aid of the town marshal, who had been shot moments before by a disgruntled debtor, a miner named Sam Covington. Covington had forced an attorney to write a receipt at gunpoint for an attachment placed on his wages over a debt of $60. When the attorney knocked away the gun that was pointed at him, it discharged harmlessly into the card room of the saloon downstairs. His law partner scurried away to find the marshal, who ascended the staircase only to be shot the moment he opened the door to the law office. Hearing gunfire inside, Richard Williams ducked into the saloon, borrowed a pistol, and was about to climb to the second floor when Sam Covington appeared at the top of the stairs, brandishing a gun in each hand. The two exchanged shots and Williams slumped to the floor with a slug in his side. When the gunman walked into the street and began firing into the crowd that tried to follow him, a rifle-wielding cattleman ended his shooting spree. Covington died in the city jail before a doctor could arrive. The marshal eventually recovered, but Richard Broad Williams died four days after being wounded. Richard was not the first of John Honeywell Williams’ boys to have his life cut short by gun violence. Jonathan Williams joined his brother Richard at a Cornish neighborhood in Gilpin County in 1870, where they began working as miners, but later started an ore-hauling business. Jonathan was killed near Nevadaville in 1877 while attending a horse race. There was bad blood between a group of Irish spectators and some of the Cornish lads, a feud that may have started simmering back in the old country. According to a history of Gilpin County, when an altercation blew up into a fistfight, "A man shot John at short range, mortally wounding him, but of such strength and hardihood was he that he attacked his murderer and killed him with no weapon other than his two hands, but he expired within twenty-four hours afterward." In another version of the story, his two hands may have held a rock which he used to beat his assassin to death. A lynch mob tried to storm the house where the wounded Jonathan Williams lay dying, but his brother met them with a rifle in his hands and persuaded them to go home. Richard Broad Williams' cool nerve and forceful manner that day may have convinced his neighbors that the young man had a future in law enforcement. The county history reported that after his death at the hands of Sam Covington, "He was so popular his funeral had to be held in the Central City Opera House to accommodate the crowd - and then hundreds stood outside. 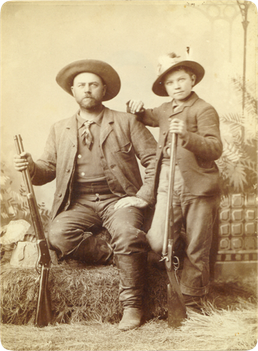 His murder was the most dramatic event in Central City in a century.” Oscar Williams, the little boy who posed with his father and their guns around 1880, also became Sheriff of Gilpin County. Adding their tenure together, father and son held the office for thirty-two years. As for John Honeywell Williams, besides a girl who died in childhood, he and his wife Jane also had two girls who lived to adulthood, Elizabeth and Eliza, and three more boys, Josiah, Henry, and Samuel, a miner, a minister, and a dentist. Josiah died in his sixties of meningitis and pneumonia. The others made it to their seventies, eighties, even nineties. All five outlived their parents, who died in their late eighties. The two boys whose lives ended early and abruptly were the ones who decided to try their luck in the Wild West, a place where their father had posed for a picture one paradisical day in 1859, when it did not seem quite so wild.